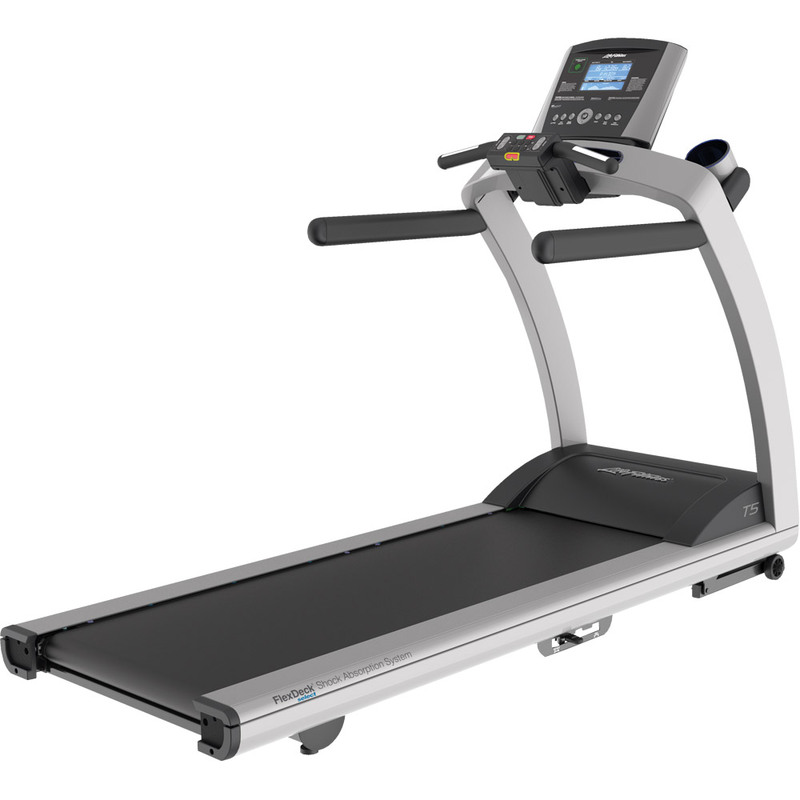 The Life Fitness T5 is one of the most advanced treadmills in the company’s lineup, with advanced FlexDeck Select cushioning, the largest running surface available and a heavy 400 lb. maximum weight capacity. With a strong motor, durable frame, incline capability and a wide variety of workout programs, it’s one of the best machines you can buy for your home gym. Speed : 0.5 - 12 mph (20 kph), You have 3 Quick Buttons to control speed:walk, jog or run and pre-set values are saved by you/per each user profile. Inclination : 0%- 15%, Same for incline, you have 3 Quick Buttons to control incline:Low, Medium and High and pre-set values are saved by you per each profile (2 profiles are available). Belt : 60" x 22" - The Belt offers Adjustable Flex Deck Cushion System. Warranty : The treadmill comes with a lifetime warranty for frame, shock absorbers, 10 years for motor, 7 years for electrical and mechanical parts and 1 year on labor. The Life Fitness T5 features a roomy 22″ x 60″ running deck, wider than found on both folding models and its little brother, the T3. That’s one of the largest surfaces you will find on any treadmill, and gives you plenty of space to stretch out while you jog or run. This is especially appealing to taller users who may find smaller decks more constricting. The T5 also has the unique FlexDeck Select cushioning which allows you to choose your desired amount of support: standard, firm or hard, depending on whether you want a lot of cushioning or prefer a surface similar to running outdoors. There are a ton of built in workout programs to choose from, so no matter what your fitness goals, there’s a workout for you. You have Manual Mode, which is basic, with no predefined intensity levels. It starts at the lowest incline and speed. You manage settings. There’s Random – based on different hills and valleys. Hill is an interval training workout built on alternating intervals of intense aerobic and regular periods of lower intensities. EZ Incline is a cardiovascular workout aimed at enhancing cardiovascular resistance. Sports Training Time-Based Goal is a workout meant to simulate outdoor running in order to train you for outdoor conditions. The basic Go console allows for 2 different users (4 with the advanced Track Connect Console), and you can save your preferred workout info: body type, Go Speed values preferences, Go Incline favorite levels. You also save: name, weight, age (important for calories burned to be counted with accuracy). Total Statistics available are: total hours, miles, how many times a workout was used. There are “My Workouts” which are preset workouts a user saves for his profile so he can start using them quickly (and not need to enter his personal info every time he chooses a preset workout). On the Life Fitness T5 a user can save up to 4 workouts for each profile (workouts names are editable). The T5 treadmill offers both contact and wireless heart rate monitoring, but you will need a chest strap as it is not included on the machine. Note that the up-level Club Series Plus model has a chest strap included for free. You can opt for the Basic Go Console or the Track Connect console, which offers more workouts plus integration with your smart phone or tablet for syncing as well as multiple popular app usability. The T5 features Quick Start functionality, space saving design and a 400 lb. max weight capacity, which is heavier than on the other F and T Series treadmills. The Life Fitness T5 is an awesome treadmill that bridges the gap between its little brother, the T3, and the commercial grade Club series treadmills, with all of the features you would expect from a commercial grade machine. It has incline capability, speciality cushioning, a generously sized runner’s deck, a powerful motor, console choices and a solid warranty. If you are in the market for a high end treadmill and money is not an object, the just under $4,000 T5 is a really great choice. We’d opt for the Track Connect console for an additional $400 as it gives you many more features to keep yourself motivated to reach your fitness goals. If you want to save a little money take a look at the T3 treadmill as well. And if you want something even more advanced than the T5, look at the Club Series models…in particular the Club Series Plus, one of the newest treadmills in the company’s lineup. Whichever Life Fitness treadmill you choose, rest assured you are getting one of the best machines money can buy.